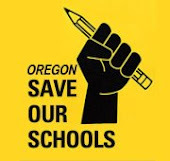 Oregon Save Our Schools has been made aware of a letter sent by five Oregon superintendents to the Oregon Department of Education and the governor's Chief Education officer in which they ask for relief from the Smarter Balanced Assessments and request that our state use the opportunity given with the new ESSA (Every Student Succeeds Act) to move away from SBAC. This news was originally published on our Opt Out Oregon page. This assessment has always been wrong for our students and our state. We applaud these district leaders for speaking up. Smarter Balanced needs to go! We applaud ODE’s efforts to quickly begin an inclusive process to guide Oregon’s response to its new opportunities and responsibilities under ESSA. We would like to join in an open dialogue with school district superintendents and other educators across our state about how we can best assess student learning and impact student achievement. This opportunity for reflection on assessment and accountability systems may also create space to consider whether current assessments are effective tools for measuring Oregon’s Essential Skills for an Oregon Diploma. This is also an opportunity to consider Oregon’s nine Essential Skills adopted almost 10 years ago. It may be the right time to review their alignment to state standards and the methods we use to ensure students are able to demonstrate Essential Skills prior to graduation. 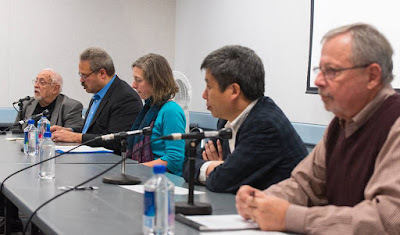 Last Tuesday, Oregon Save Our Schools brought a discussion on what our schools would look like with assessment for learning to Salem Public Library. Our panel included Lew Frederick, who is currently running for Oregon Senate District 22; Elizabeth Thiel, Portland parent and teacher newly elected vice president of Portland Association of Teachers; Yong Zhao, Presidential Chair and Director of the Institute for Global and Online Education and Professor in the Department of Educational Measurement, Policy, and Leadership at University of Oregon; and Rick Stiggins founder and president (retired) of the Assessment Training Institute in Portland as well as a researcher on classroom assessment and author of many books on that subject. The four panelists spoke about the flaws in our current assessment system, specifically the Smarter Balanced Assessment, which all agreed is a flawed measurement. Frederick talked about the history of standardized testing as a gatekeeping mechanism used to exclude people of color. Thiel told the audience that the Smarter Balanced Assessment yields no useful information to her as either a teacher or a parent in understanding where a child’s strengths and weaknesses lie and how to help them. Yong Zhao discussed the false meritocracy that the tests support, wherein students who are from higher socioeconomic backgrounds do better on the tests than students from poverty, thus rationalizing maintenance of the status quo and causing an under valuing everything, including the Arts and Music, in favor of high scores in English Language Arts and Math. Stiggins stated that he is still waiting to see any empirical evidence in the form of peer reviewed, replicated studies, that prove that high stakes standardized testing used for strict accountability does anything to improve teaching and learning. He also questioned where the attitude of or effect on the learner in relation to our current system has been taken into account. The audience had many questions regarding assessment systems, so many that there was not enough time for all of them to be answered. All panelists spoke of the opportunity to change our current system under the new ESSA and the importance of involving students, parents, and teachers in that discussion. Lew Frederick mentioned how very important it is for citizens to make their views on education known to their representatives and to stay abreast of and involved in the ongoing political discussions and decisions about education. Oregon Save Our Schools thanks all of our panelists for helping bring this important discussion to a wider audience. We hope that our audience members will continue to seek answers to their questions about education and assessment and we hope all Oregonians heed the advice of our panelists: stay involved in and informed about what is happening in education, and keep in touch with your state and federal representatives, especially while the new rules for ESSA are being rolled out. We have an opportunity to create a better system. Let’s all get involved and do it! Read more here from the Salem Statesman Journal. Today we are featuring another post from OSOS and cofounder Joanne Yatvin's blog, The Treasure Hunter. Many thanks to Joanne for allowing us to repost here. Today’s post is something I wrote long ago--1994 to be exact. It came to my mind again because an old friend referred to it. I have changed a few words to modernize the piece, and I want young readers to know that "The Catcher in the Rye" was a top best seller in its time and often taught in high school English classes. When I first read J.D. Salinger's novel, “The Catcher in the Rye", the catcher metaphor struck me as silly, a clumsy device invented to justify a meaningless book title. Would any real teenager see himself -- as the novel's protagonist, Holden Caulfield, does--as a rescuer of children, and why were children in need of rescue anyway? Although I am still cynical about Salinger's creative motivation, I find the "catcher" image far more poignant and real in today's world. In contrast to the world of Holden Caulfield's rye field near the cliff, our world today has so many children who are physically, economically, socially, or psychologically in danger. Statistics don't tell the story of many children's tragic lives, but we as educators see the evidence day after day in their anger, apathy, self-destructiveness, and resistance to learning. Because we are where children are, because they will drive us crazy if we do nothing, and because we care, teachers must be today's catchers in the rye. I have lost faith in any and all large-scale solutions to educational problems. They just put more paperwork, regulations, and job titles between children and the help they need. Where schools are failing, it is not because they don't have enough programs and consultants, but because they have lost the human touch. Children mired in the morass of family and community decay can't benefit from higher standards, instructional technology, or remedial programs; they need caring adults to pull them out of the muck and set them on solid ground--one at a time. Only then can each child, in his or her own way, begin the adventure of learning. I have no magic formula for child catching. Each rescue must be worked out in personal terms that fit the catcher and the child. It probably doesn't matter if the means are sophisticated or crude, gentle or tough, as long as at least one sensible adult is looking after the welfare of each child. I do believe, however, that there are some conditions that are essential for child-catching to work. The framework of operation must be small, physically close, and flexible. Forget any plan for recruiting 500 teachers as catchers, training them, and setting up a schedule for patrolling the rye. We need small schools or schools that are divided into small community units; classroom time, space, and organization that allow personal relationships to flourish; legitimacy for play and conversation in school; authority in the hands of front-line practitioners; and educational visions unclouded by political pressure to cover academic ground, raise test scores, or produce workers for industry. Within such a framework, teachers are able to catch children who stray too close to the edge. They know each child as an individual and see most of the things that are happening to him or her. Kids hang around and tell them what they cannot see. Teachers also find time to talk to each other about classroom problems and to work with their classes to make changes in rules or processes without having to implement any special programs or bring in any outside consultants. Although permanent rescue is a slow process and an imperfect one, catching often shows quick, dramatic results. I credit those results to what I call the "wart theory of education". In essence, that theory asserts that children's problems are like warts: If you can destroy just a few of them, the rest will get the message and go away. Children who are carrying intolerable burdens of poverty, family dysfunction, bad learning habits, and social ineptitude may shake them off in the space of a few weeks when a caring teacher takes time to talk through a single problem with them or tutor them in one small skill. I have seen schools that do an impressive job of rescuing large numbers of children over time. Ironically, they are not the same schools that produce the highest test scores, send the most students on to college, or attract the attention of the media. Mostly, such schools don't even worry about whether the data on achievement and behavior makes them look good. Catching children is its own reward when you're out there in the rye.